Skiing in the Easter holidays is ideal for those who like their snow served up with plenty of sunshine. There’s usually a good snow base towards the end of winter and big snowfalls are surprisingly common. The best time to ski is in the morning, after that the spring sunshine can make the snow a little slushy. Afternoons are a great time for a long leisurely lunch or to try other mountain activities like swimming, walking, tobogganing, snow tubing and climbing. Ideally you should choose a high-altitude resort, northerly slopes or one with great artificial snow. We've picked 8 French resorts with the deepest snow bases and most open terrain to ski this Easter. Les Arcs is the highest ski resort in the extensive and varied Paradiski Area (425km) with everything from glacier skiing (3250m) to treelined runs and top-to-bottom skiing in springtime. La Plagne is one of the biggest ski resorts in the world and has plenty of wide, gentle slopes, ski-in/ski-out accommodation, reliable snowfall, easy-to-reach powder-packed off-piste and a huge choice of restaurants. Linked with Les Arcs, it makes up part of the 425km Paradiski area. Tignes & Val d’Isere combine to form the Espace Killy ski area which stays open until early May. Tignes offers high-altitude skiing on the Grande Motte Glacier while Val d’Isere’s north-facing slopes retain excellent snow cover. 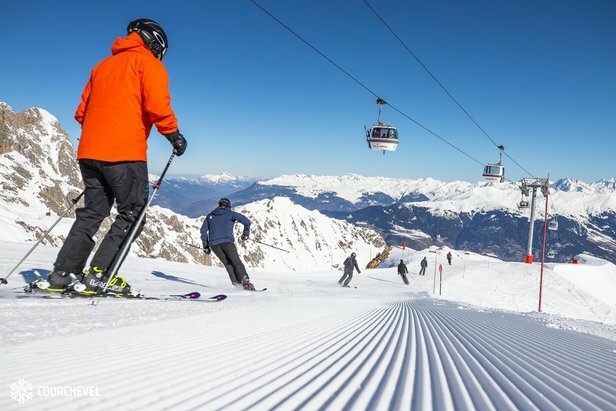 Courchevel has an top-notch lift system, many north-facing runs, great snow record, free beginners' lifts, huge selection of intermediate runs allowing you to clock-up the miles and a well-run kids' club. Val Thorens is the highest resort in Europe, at 2300m, and is snowsure right through to May. The resort makes up part of the huge, interlinked 3 Valleys ski area and has a compact but lively centre. La Rosiere is a traditional chalet-style resort smaller and quieter than its more popular neighbours. The Savoyard village is dotted with a few shops, laidback bars and ski-in accommdoation. This high-altitude resort shares the Espace San Bernardo ski area (150km slopes) with La Thuile in Italy. Avoriaz is a car-free, sunny village with compact centre, ski-in/ski-out lodgings, shady snowsure slopes, great position on the Portes du Soleil circuit, leading resort for freestylers (five terrain parks and a super-pipe), plenty of good off-piste, access to the legendary Swiss Wall and a renowned kids' club.